Sliced turkey breast with Swiss cheese and lettuce on wheat bread. turkey breast (turkey breast meat, water, salt, turbinado sugar, vegetable oil), wheat bread (bleached enriched flour [wheat flour, malted barley flour, niacin, reduced iron, thiamine mononitrate, riboflavin, folate], water, coarse cracked wheat, whole wheat flour, soybean oil, yeast, honey, wheat gluten, cultured wheat flour, granulated sugar, vinegar [contains sulfites], salt, dough improver [unbleached wheat flour, wheat gluten, 2% or less of: enzyme, ascorbic acid], wheat flour and enzymes, ascorbic acid), swiss cheese (pasteurized part-skim milk, cheese culture, salt, enzymes), lettuce, light mayonnaise (water, soybean oil, modified food starch [corn, potato]**, eggs, sugar, salt, vinegar, lemon juice, sorbic acid** and calcium disodium edta [used to protect quality], natural flavor, vitamin e, **ingredient not in mayonnaise), yellow mustard (vinegar, water, mustard seed, salt, turmeric, paprika). Celebrated at Thanksgiving, but neglected most of the year, the humble turkey warrants a higher profile in our diets, we think. This is just the sandwich to help you honor this tasty bird. 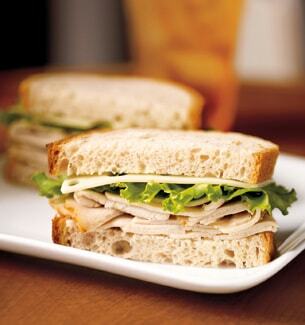 Featuring natural turkey breast slices, it comes with plenty of trimmings: real Swiss cheese and crispy leaf lettuce with tangy mustard and light mayonnaise on the side – all served on hearty wheat bread. Go ahead and gobble.